Enduro Racer (Master System) (エンデューロレーサー) for the Sega Master System, known in Brazil as Super Cross, is a racing video game released for the console in 1987. It is a very loose interpretation of the arcade game, Enduro Racer, however radically changes gameplay for undisclosed reasons, being played from an oblique perspective similar to the likes of Paperboy as opposed to the third-person perspective seen elsewhere. The game was significantly cut down for the Western release in order to fit the game onto a cheaper 128kB ROM as opposed to the original 256kB Japanese version. Five of the original ten courses were cut, with the five remaining courses now having to be played twice. It's also missing the post-game map that charts your progress, as well as the dirt bike image on the title screen. Captain Silver would receive a similar fate for it's US release too. The Japanese version (TODO: confirm for other versions) suffers from a serious bug: By moving almost to the rightmost point, it's possible to clear the whole course without collisions. 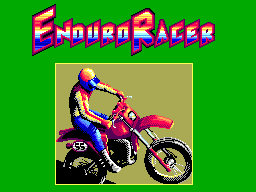 This version of Enduro Racer was released for the Wii's Virtual Console service in 2008. Main article: Enduro Racer (Master System)/Magazine articles.